This special Valentines branded whisky gift set contains Single Malts from across Scotland's famous whisky regions together with Wale's award winning Penderyn single malt. 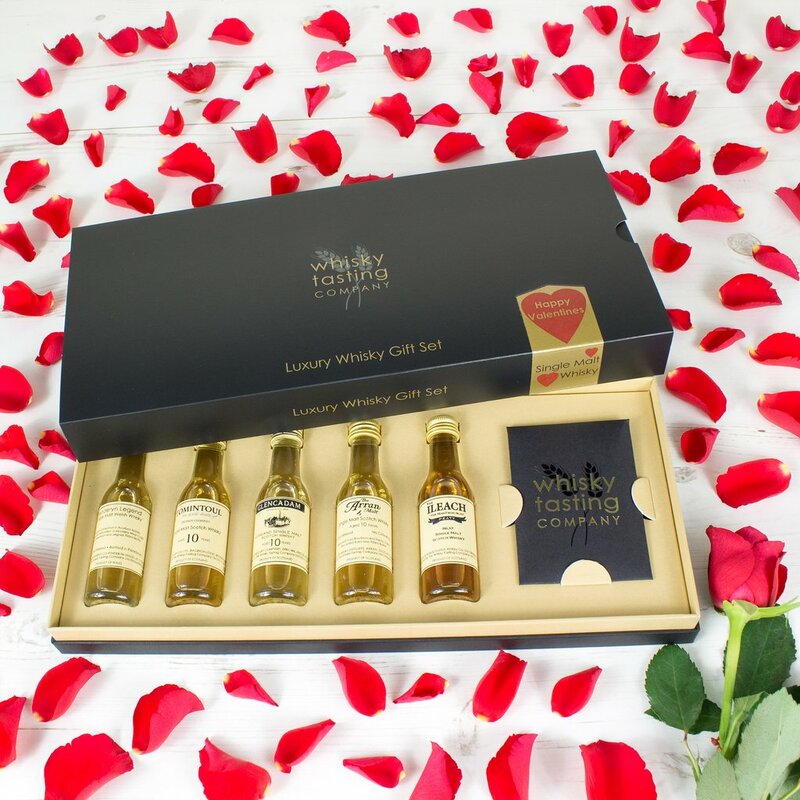 Beautifully presented, this Valentines Whisky Gift Set will give your loved one the opportunity to appreciate the regional differences of Single Malt Whisky. 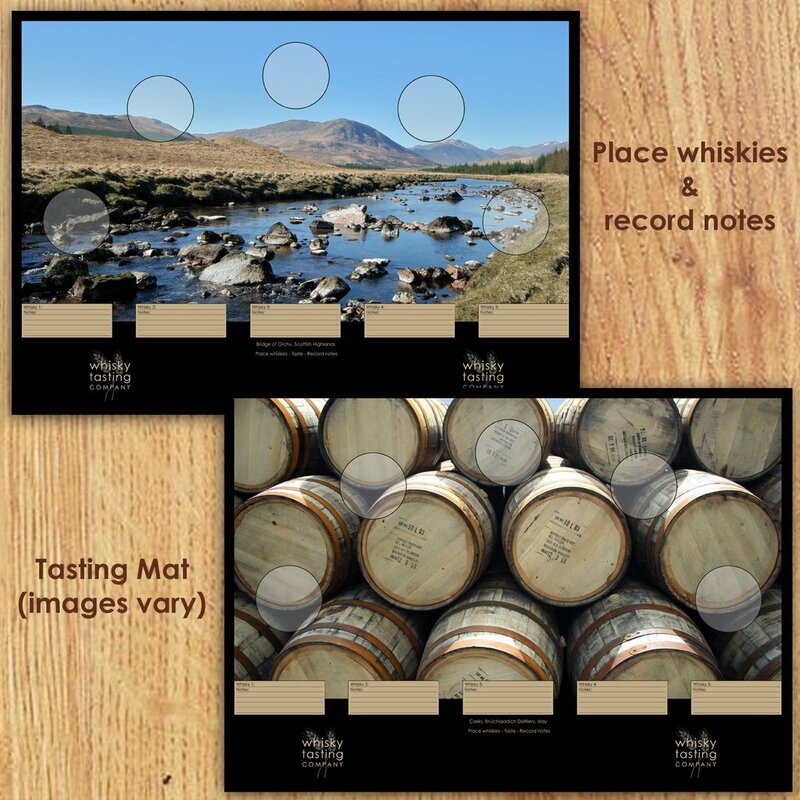 Your gift set comes with tasting cards, stored in the Whisky Tasting Company envelope; these provide a special keepsake once each whisky has been enjoyed, and a tasting mat (featuring a stunning Scottish landscape) provides the perfect place to arrange each malt and record your own personal tasting notes. 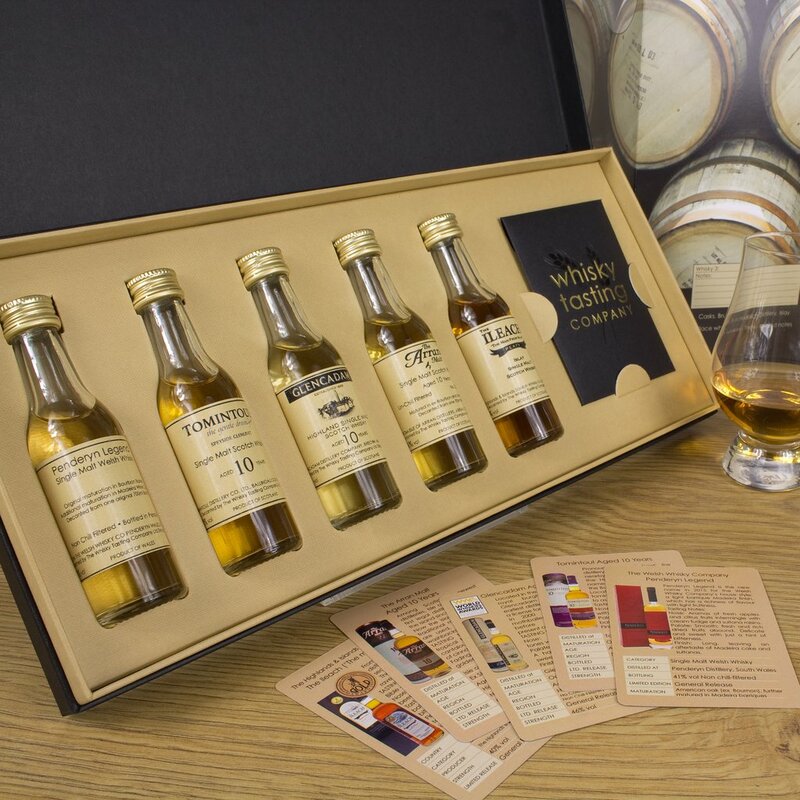 You can add a personal message when ordering this whisky gift set using the options in the personalisation tab. 1. Winner of the World Whisky Awards for the 'Best Highland Malt in the under-12 years old category, Glencadam pride themselves on producing this whisky without the addition of caramel colouring and without chill filtering the whisky. 2. Penderyn Legend is The Welsh Whisky Company's Single Malt that has been distilled in a unique copper pot still, matured in Bourbon barrels and then 'finished' in rich Madeira wine casks and bottled at 41%vol - this whisky has a fresh and clean taste and is well balanced. 3. This Distillery bottling of 10 year old Arran Malt is produced using unpeated malted barley, helping to create a beautifully rounded and well balanced single malt - winning Silver Medal Winner at the International Wine & Spirit Competition in 2006, and recently scoring 93pts out of 100 in Jim Murray's Whisky Bible. 4. The Ileach - Gaelic for 'The Man from Islay" - is a highly revered single malt whose distillery on Islay remains the secret of the brand owner, The Highland & Island Scotch Whisky Company and should be stocked in the drinks cabinet of any Islay whisky fan. 5. Tomintoul (pronounced 'Tom-in-t'owl') Distillery is in the Speyside region of Scotland & draws the water for it's whisky from The Ballantruan Spring with the distillery being located in the picturesque Glenlivet estate. Tomintoul is sometimes referred to as Tomintoul Glenlivet - 'The Gentle Dram'. By ordering this gift you are confirming that you are over 18 years of age, please confirm this by selecting YES to the first option in the personalisation tab. You have 14 days, from receipt of cancellable goods, to notify the seller if you wish to cancel your order. Goods that are personalised, bespoke or made-to-order to your specific requirements, perishable products, earrings and personal items sold with a hygiene seal (cosmetics, underwear) in instances where the seal is broken are non-refundable, unless faulty. Please read the MyGiftGenie returns policy for full terms. UK delivery only. Your item will be delivered to (mainland) UK in 2-3 working days from the day that your order, occasionally this may take a day or two longer in rural or remote areas, the charge is £3.75. 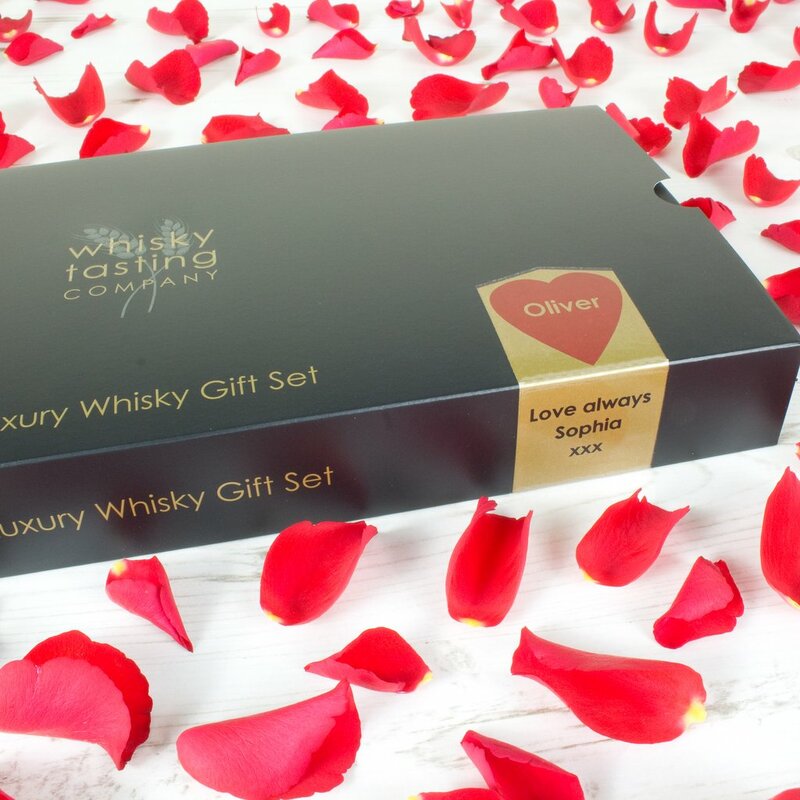 We will notify you by email once your Valentines Single Malt Whisky Gift Set has been dispatched. All Whiskey Tasting Company subscriptions have free UK delivery.